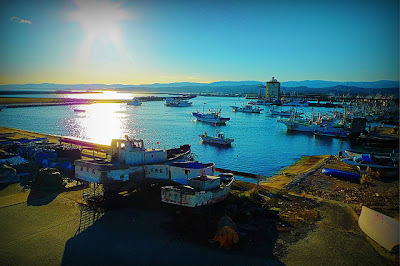 Devoid Of Culture And Indifferent To The Arts: Recipe: You ought to make Otsu. Recipe: You ought to make Otsu. There's mystery afoot in the name of this Japanese soba noodle dish. First, Otsu is the capital city of Shiga province in Japan. Secondly, "otsu" in old Japanese language meant strange, quaint, stylish, chic, spicy, witty, tasty or even romantic, depending on the context of how it was used. Seems to be quite a word. Now knowing the definition, what that word has to do with a city name or a noodle dish is beyond my understanding. But I can speculate about the dish. 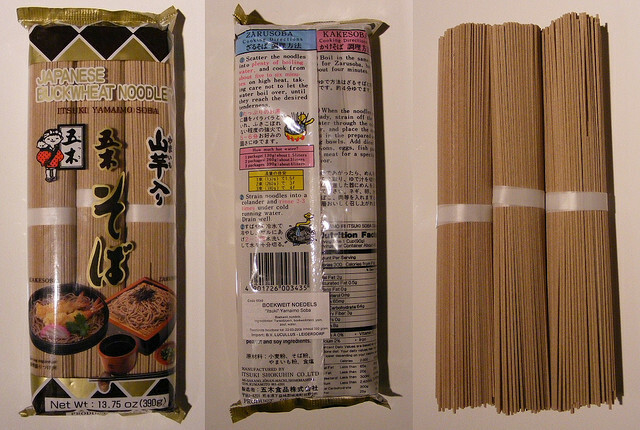 These noodles are many of the words in the definition. in packages of 3 to 5 bundles. Use about 300g for this recipe. One other thing I understand is what makes up Otsu. Otsu always uses buckwheat soba noodles, some sparse combination of barely cooked vegetables (often one is cucumber) and commonly tofu. All is then tossed in a sweet-sour-spicy sauce. The sauce is fairly dominated by ginger. Now couple that with all the citrus in the sauce and still crisp vegetables. You can quickly see this makes the entire affair quite fresh tasting. This is my version of Otsu which sits comfortably among other Otsu recipes I have seen. I chose shrimp as my protein but it is commonly made with tofu and therefore vegetarian. I have seen recipes that use pork, as well as myriad other vegetables. One blogger even posted a list of 11 veggies for you to choose from. Hmmm...I think they just got carried away. To me that would be like posting a recipe for chicken noodle soup and saying you don't have to use chicken or noodles. It's not chicken noodle soup if you don't! 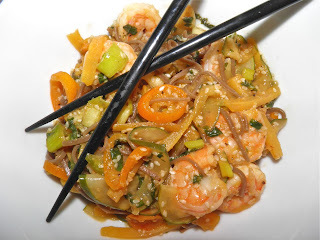 Their recipe also had a peanut sauce, which makes it an entirely different affair than Otsu and probably far closer to Phad Thai. Probably tasty, but not Otsu. I'll stick my neck out here and say this is pretty middle of the road. I hope you try it. The list of ingredients seems a bit on the long side, but for the most part it's just a touch of this and a touch of that, so it's not so bad. If you can't find kumquats I would suggest segmented orange, but it wouldn't be the same. The kumquat peel ads a je ne sais quios that segments wouldn't impart. One word about cucumbers before the recipe. I have listed "field" cucumbers and then bracketed "English" cucumber as an option. Our common field cucumber in North America has a higher water content and larger seed pocket than English "cukes." They are also only about half as long. You have to remove the seeds so that's why one whole field cuke and only one half an English cuke. Very, very tasty. The kumquats are a stand out addition. Additional chopped cilantro for garnish if desired. Make the sauce first. Add all ingredients, except for the oils, in a blender or food processor and purée. With the blades still running pour in the oils and purée until well mixed. Let sit in the processor. 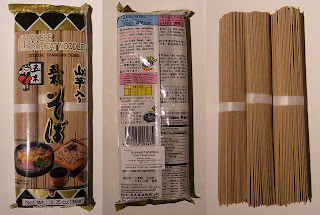 Boil the soba noodles in salted water according to the package directions. Drain off the water. Prepare the cucumber and kumquats. Cut the cucumber in half lengthwise and remove the seeds. Slice thinly. Wash and slice the kumquats. Set both aside in a bowl. Peel and cut the carrots into matchsticks. Set aside separately from the cucumber and kumquats. Peel the shrimp. Sauté the carrots for about 2 minutes in 1 tbsp of oil in a large sauté pan. Then add the shrimp and continue to cook until the shrimp are almost opaque, about a further 2 minutes. Add the cucumber and kumquats and let heat up just a little, about 2 more minutes. Then reduce heat to keep warm and add in the chopped green onions and sesame seeds. Toss the noodles together with the shrimp mixture, sesame seeds and the chopped cilantro. Pulse the sauce again if necessary (it will have probably separated) and then toss into the noodles and shrimp mixture. Serve warm, or chill and serve. If chilled, you will notice the sauce gets somewhat absorbed into all the ingredients. Note: For the more common vegetarian version, brown extra firm tofu cubes in some oil. Then add in the carrots and continue on with the recipe. Recipe: How to make effervescent kéfir. I did it!